The What: At InfoComm 2016, WyreStorm will demonstrate ScreenLink, a new collaboration software for wired or wireless (Wi-Fi) network display sharing from Windows and Mac devices to its 5x1 HDBaseT and AV Over IP Presentation Switchers, SW-0501-HDBT, and NetworkHD NHD-SW-0501 respectively. The What Else: ScreenLink supports the simultaneous connection of up to 26 Mac or Windows laptops/computers to each SW-0501-HDBT or NHD-SW-0501 presentation switcher. Up to four computers can be displayed at the same time through a variety of configuration options, including single, dual, PiP, and quad-view. 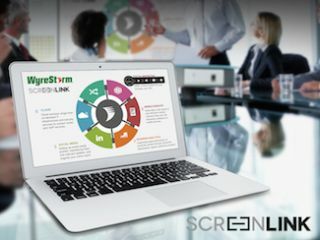 ScreenLink features a simple three-step onscreen setup process with fast connection of new devices. Security is also a priority, which can be set to fixed, random, or no access code requirements. After installing the software application via a direct download from the presentation switcher, USB key, or web, users then only need connect to the local network, enter the onscreen number to start ScreenLink, and beam their screens over the network to a display connected to the SW-0501-HDBT or NHD-SW-0501. The convenience of wireless network streaming allows users to share their computer screens without worrying about connecting cables, ideal for viewing spreadsheets and documents to the room. For applications where latency is important when sharing of audio and video, such as video conferencing, voice over IP calls, software demonstrations, and trainings, both the SW-0501-HDBT and NHD-SW-0501 models support wired VGA and HDMI inputs for fully uncompressed, zero-latency sharing. Both switcher models offer compact, high-performance switching and auto scaling of four HDMI and one VGA sources up to 1920x1200p at 60Hz, microphone input with phantom power, stereo inputs, and auto-mix stereo audio output. A variety of control options include front panel, built-in web UI, CEC, contact closure panels, IP, and separate or combined RS-232 to manage and control the switcher or external devices. In line with WyreStorm’s product development strategy of focusing on HDMI, HDBaseT, and AV-over-IP technologies and the unique benefits each platform offers for specific applications, the SW-0501-HDBT features HDMI and HDBaseT outputs with PoH power for transmission up to 100 meters (328 feet), best suited for transmission to one or two display devices within a single location. New to the line in Q4 2016, the NHD-SW-0501 model offers the features an H.264 IP streaming output for use as part of NetworkHD 100/200-Series AV-over-IP systems from a central location to multiple displays and video walls in multiple zones. The addition of IP streaming capabilities opens up the enormous potential of combining the presentation switcher features and ScreenLink content-sharing features within the NetworkHD system for scalable AV distribution that makes it well suited for scalable corporate or education applications of virtually any size.